If you have either an above ground pool or inground pool in your backyard, the next logical step is to have a pool deck professionally installed. But before you pick up the phone to call your Maryland deck builder, there are a few things you should take into consideration. Pool Deck Material: Do you prefer a low maintenance composite pool deck or a wood pool deck? There are several benefits to both types of decking. Pool Deck Color: Choose a composite deck color or treated wood stain that complements your outdoor space. But remember, your pool deck material is going to get warm and may even be hot on bare feet. And a dark colored pool deck surface will get warmer than a lighter colored surface. Pool Deck Safety: Make sure you choose a pool decking material that has a slip-resistant surface. Pool Fence: Don’t forget to match your new pool deck to your existing pool fence, or vice versa. Call Freedom Fence & Home: Please take a moment to browse our gallery of wood decks and low maintenance decks (click on any image to enlarge). 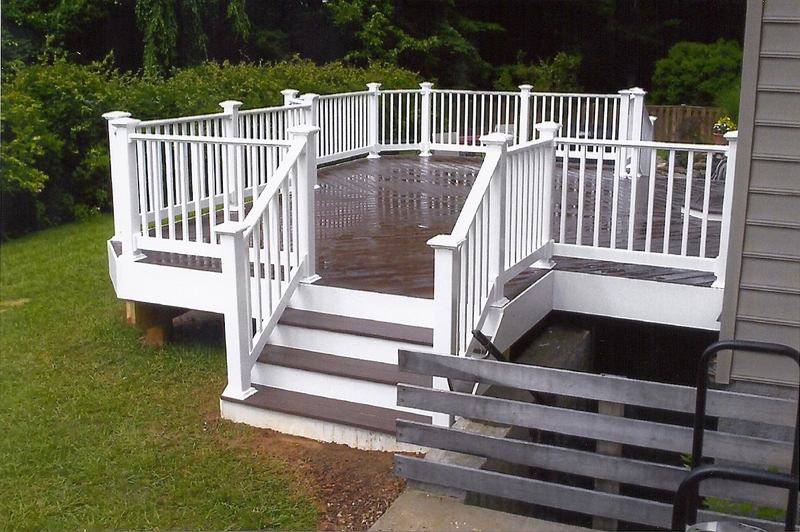 With 40 years of experience, Freedom Fence and Home has provided the highest quality fence and decking materials to its many residential and commercial clients throughout in Baltimore, Maryland and Harford county as well many residential clients in Baltimore county and Baltimore city. You are well on your way to your own personal outdoor oasis. This entry was posted on Wednesday, August 21st, 2013	at 5:21 pm	. Both comments and pings are currently closed.